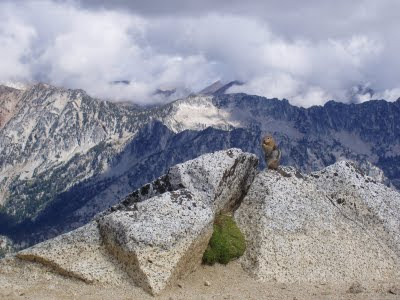 I met this chipmunk while I was backpacking in the Wallowa Mountains. Oblivious to the view, he was a professional panhandler and knew how to get a handout while posing for the camera. 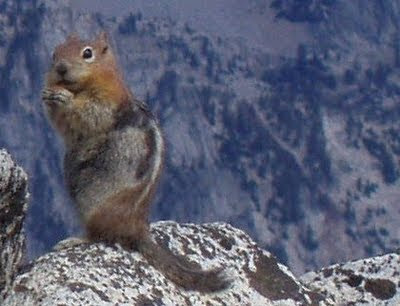 At the word "chipmunk" one might conjure a little chip of a monk, with cousins named Alvin, Simon and Theodore. Despite their innocent look, though, chipmunks are shrewd; they are delicate yet tough. Their cheek pouches can expand up to three times the size of their heads and they fight viciously for their mates. Write about the chipmunk. Avoid the word "cute." Great view and the chipmunk is neat looking, coz I'm avoiding to use the word "cute"